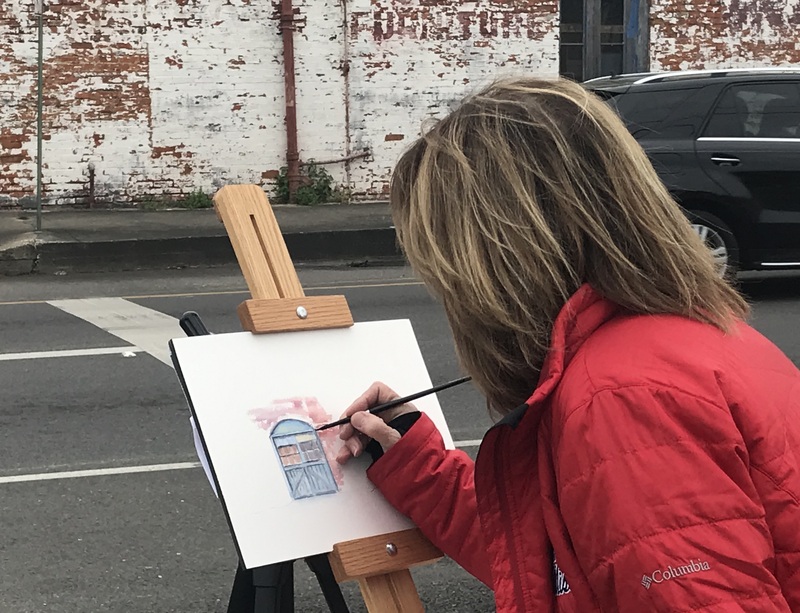 On Saturday, the Shadows Plein Air Competition hosted a Quick Draw. Charlie (my dog) and I walked downtown to stalk talk with some of the artists. Sherri Thomas (@sherrithomas.artist) from Larsen, Wisconsin was painting the historical Mount Carmel which had been the original home of a founding family, the Duperiers. Her first layer of paint was drying in the cool air while she added detail elements. 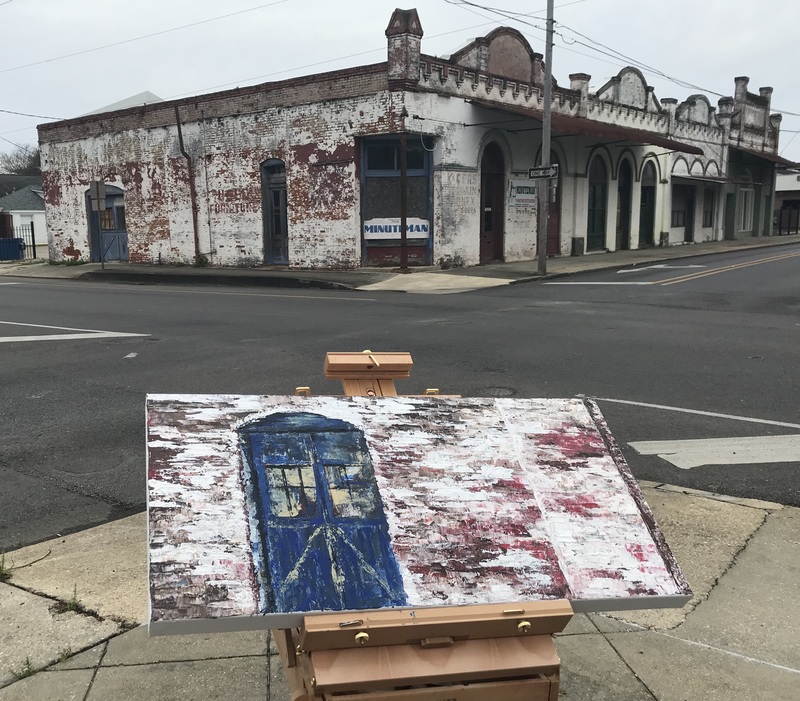 Debbie and Sandy were on a corner with two other artists all painting the same building. I had to stop and look and let the scene sink in. I pass this building daily and have only thought of it as an old, dilapidated building where the Minuteman restores furniture. I had not noticed the amazing colors of the bricks or the blue doors. I captured three of the four artists’ paintings and marvel at the complete differences in interpretation. 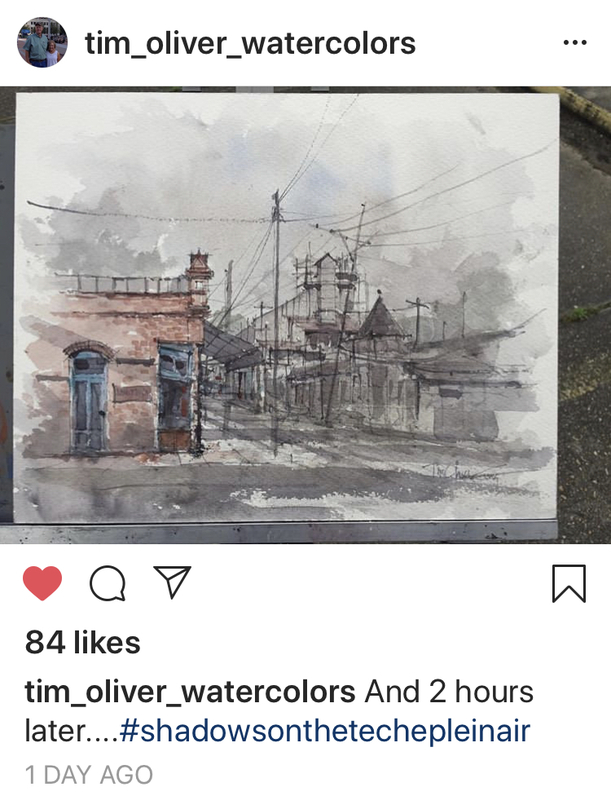 Debbi Myers from Oxford, MS works in watercolor. Sandy, Debbie’s sister from Covington, LA works with acrylic and a pallet knife. 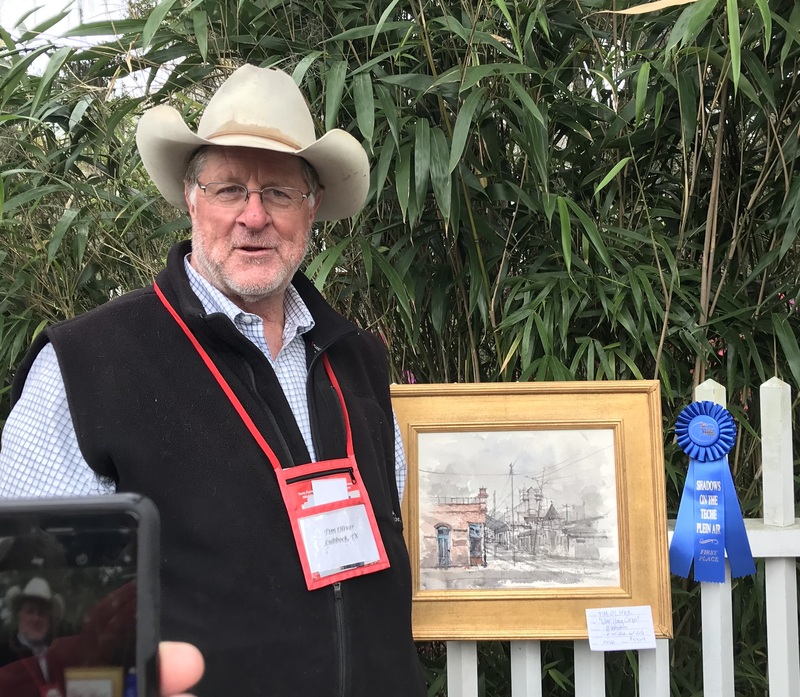 Tim Oliver won first place for his Minuteman in watercolor. A closer view of the winning painting. Like art, writing can take on different perspectives and interpretations. The artist creates a mood with the setting. The writer sets a tone. The reader comes to the art or writing with their own perspective. There’s big magic in all of this creating and observing. My life is richer for having observed these artists in action, and now, I have a few pieces added to my own art collection to remember fondly this experience and the artists I met. Enjoyed this tour with you… I like each artist’s interpretation. These are amazing! What a cool event for your community to host. Thanks for bringing us along with you, Margaret! Really interesting, I wish to be there some day! Yes, big magic in all creativity! What a great day for you and Charlie! Whoa – those three paintings really are incredibly different. Thanks for taking us on this tour & for the reflections on interpretation. Glad you stalked the artists today. I have so loved these posts, Margaret! I really wish we’d have an event like this around here. Fun, and thanks for sharing it with all of us! I enjoyed the walkabout and looking a little more closely at the artwork. Perspective is the key word here. I love seeing this all over again this year! What a beautiful gift these artists bring to your community. An event like this would be so neat to have here. What a fascinating post! I love how art-rich your life is, Margaret, and am always grateful when you share some of that with us. I was especially intrigued by the different interpretations of the building with the blue doors. Isn’t it wonderful that you’ll never look at it the same way again? It’s just like what a wonderful poem can do…help us see our world in new ways!